History: (What If? I#37/3) - After he betrayed Galactus during their first visit to Earth, the Silver Surfer was stripped of the Power Cosmic, returning him to his original human form of Norrin Radd. Galactus then left, stranding his former herald on Earth. Uatu the Watcher, who had witnessed the proceedings, left Radd and the Fantastic Four with a vague reference to a homing device that Uatu had in his possession. 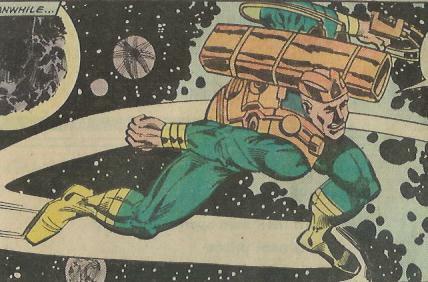 The former Surfer and the Fantastic Four then used the Pogo-Plane to travel to the Watcher's home on the moon. As they searched his facilities for a device that could help Radd return to Zenn-La, Galactus returned there first, intent on finally devouring the planet. Radd's former lover Shalla Bal, learning that the Silver Surfer was not with Galactus, rushed to learn why. Back on the moon, Reed Richards found the correct device and hooked Radd into it, sending him on his way back to Zenn-La at a rate that would only take hours. On Zenn-La, Shalla Bal confronted Galactus, and when she learned that he had been exiled on Earth, asked Galactus to make her his herald if he spared her planet again. 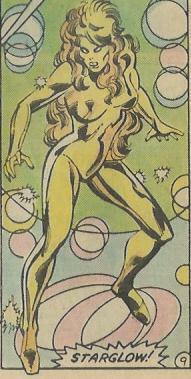 Galactus agreed, and transformed her into Starglow. Not wishing to go through a similar situation as he had with the Surfer, he also stripped her of all memories. As she left Zenn-La, she encountered Norrin Radd, who recognized her. When the recognition was not returned, Radd confronted his former master again, and having a sense of grief over his former herald's new loss, Galactus returned Radd to his Silver Surfer form. Again not wishing to repeat the past, Galactus limited the Surfer's restored powers, creating a barrier that prevented the hero from leaving Zenn-La. Galactus and Starglow then departed, leaving the Surfer to be a hero for his people, but without the love he gave his humanity for. Comments: Created by David Anthony Kraft, Mike Vosburg and Steve Mitchell. This world diverged from Earth-616 during the now-classic Fantastic Four I#50. Stripped of his powers for betraying Galactus, Norrin Radd was stranded on Earth. With the aid of the Fantastic Four, he searched the home of Uatu the Watcher for a device that could return him home. 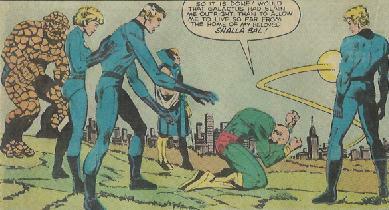 When Reed Richards found such a device, Radd used it to travel the starways. He arrived near Zenn-La just as Galactus and Starglow were departing, but was devastated that his lover no longer remembered who he was. Galactus, wishing to ease some of Radd's grief, returned to him a limited amount of the Silver Surfer powers, but placed a barrier around Zenn-La so that Galactus would never meet him again. The Silver Surfer remained a hero on Zenn-La. (Shalla Bal) When Galactus returned to Zenn-La, Shalla Bal was distraught to find the Silver Surfer, her former love, was not with him. Wanting to save her planet as well as gain a way to cross space to find Radd, she offered to become his new herald. He agreed and transformed her into Starglow. However he also wiped out her memories of her home planet and Radd. When Radd found her, she did not recognize him and left with Galactus.